Globecast to distribute Euronews' new HD channel on Eutelsat. Paris, November 2016: Globecast has been contracted by Euronews, the most-watched international news channel in Europe to bring its new HD channel to viewers across Europe, North Africa and the Middle East. The channel’s world-first launch in HD from Eutelsat’s HOTBIRD video neighbourhood follows the announcement by Eutelsat and Globecast at IBC 2016 to drive HD growth at Eutelsat’s most popular broadcast location. Euronews covers world news and broadcasts in SD, 24 hours-a-day, seven days-a-week in 13 languages: Arabic, English, French, German, Greek, Hungarian, Italian, Persian, Portuguese, Russian, Spanish, Turkish and Ukrainian. 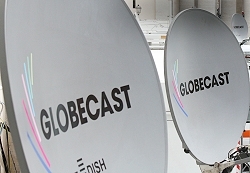 Globecast has an ongoing relationship with the channel, distributing the SD variant. The HD version will lasunch with an English-language feed in November. The channel will be encoded in MPEG-4 DVB S2 in a new HOTBIRD platform designed to host premium international news and information channels.